“Like a turd in the wind”, let’s get this post rolling. So the second trailer for Venom dropped recently and…it didn’t make me any more excited. It’s a loose adaptation of two multi symbiote stories – Venom: Lethal Protector (Venom’s first solo miniseries) and Planet of the Symbiotes. To give it credit, the symbiote on symbiote violence looks cool, but that’s about it for me. Will I see it? Yes. Am I excited for it? No, the marketing has been as awful as that (hilarious) turd line. Do I hope its good? Absolutely. I love the Venom character, he was one of my favourites as a kid (especially with his great portrayal by Hank Azaria in Spider-man: The Animated Series) and teen, and has had some great comic stories (especially in bringing us Carnage). Also, it’s now looking like the film will be rated PG-13 because they want the character to be able to interact with Spider-man…which…just…ugh. I’m gonna say the same thing I said for Deadpool – the character exists in a PG-13 medium already in the comics, so it doesn’t need to be R. That being said, both lend themselves to that R-rated environment. One of the big selling factors when the story that they were making a Venom film dropped was ‘it’ll be r-rated, it’ll be true to the character’, to go back on it now is dumb. But the dumbest part? That it needs to be PG-13 so he can interact with Spider-man. Look, in the Venom comics he was killing bad people in biting off limbs (and making them look like turds in the wind, as this dumb line promises) – when he would cross back over into the Spider-Man title, guess what? He wouldn’t do that! Why? Spidey would make him swear to not kill or (or horrifically maim) while they (uneasily) worked together. There is no reason why it couldn’t be the same in the movies. To use Deadpool as an example again, Disney said they’d keep the R rating. Think that means though they wouldn’t have him pop up in a non-r X-Men or Spidey film? I doubt it, and it’d be easy to do (have him go on a bleep-filled rant because he hears the bleeps and he’s being censored), and it’d be like when he pops up in other peoples titles. *sigh*…so many things about Sony’s decisions make no sense to me. Always loved this shot. Great moment from a great 3 parter. Sony has announced their intention to move forward with a movie based on Silk. Now I like Silk, and if this were the MCU, I’d be all for this. She’s a great character, very interesting, and a great way for representation without a lot of fan backlash/political mumbo-jumbo. So why am I counting this movie as a negative? Much like Venom, Silk (Cindy Moon) is a character who is insanely linked to Peter Parker – she was bitten on the ankle by the same spider. Sony, in setting up their ‘Spider-verse’ with a number of films – but without Spider-man. For some characters, sure, it could work. But for others (like Venom, Silk, or either of the living Parker clones/Scarlett Spiders), they need a Peter Parker, they need a Spider-man. Otherwise, there’s gonna be a hatchet job to their origins, and it’s not gonna be the complete character. If Silk or Venom were tied into the MCU, they could be done right, and I would be A LOT more optimistic and excited about both. 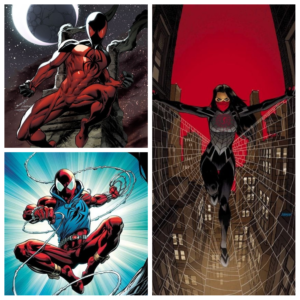 The Scarlet Spiders (Kaine & Ben) and Silk! Power Rangers is turning 25?! WHAAAAAAAAAT. *ahem* Anyways, I haven’t watched any of the current season Super Ninja Steel…or the previous season Ninja Steel…and aside from trying a couple episodes of Samurai/Super Samuria and Mega/SuperMegaForce, I haven’t watched a full series of Power Rangers since the fantastic RPM, but I’ve been able to keep up with whats happening (thanks Linkara! )…but I digress. Anyways, the Anniversary episode is called “Dimensions in Danger”, and features the current Super Ninja Steal Rangers teaming up with 10 past rangers to face an army of clone or robotic rangers. Colour me excited! Before we get into the cast of people coming back, there was something interesting in the above trailer. Jason David Frank (the MMPR Green & White, the Zeo Red, 1st Turbo Red, and Black Dino Thunder rangers) is back as Tommy, up up until this trailer all promo stuff has been for the Green Ranger. But, in this trailer, we see Tommy demorph from the Black Dino Ranger, and later we see the Black Dino and MMPR Green Rangers fighting. Perhaps the evil Green Ranger is back? Which Tommy is the good Tommy? I’m mad interested! A PICARD SHOW! FINALLY SOME TREK NEW’S I CAN GET BEHIND! Seriously, this is very exciting. The news for Trek lately for me has been bad. It’s been all about Discovery (which does nothing for me, I tried and really didn’t like it) and on the movie front that Chris Pine (Captain Kirk) and Chris Hemsworth (Kirks dead but returning dad) are probably leaving Star Trek 4 (due to pay disputes). All of that is a bummer, but then along comes the Picard news! We don’t know anything of the show yet as it’s still in its early stages, but we know it’s coming! This news excites me a lot. Of the captains, Picard is my favourite, TNG was my gateway into Trek, and I honestly think a Trek show (or movie) taking place after the intro of Trek 09 (by that I mean the black hole/destruction of Romulus that made Nero go nuts and sent him/his crew and Spock to an alternate reality) has the most story potential (Romulus is gone/the Romulans are borderline extinct, there be a HUGE power void for someone (eg Klingongs) to try to seize, or the Borg could make a move, or the Dominion, and so on) – it’d be an organic way to weave more action into the story if they wanted to. All I hope for out of this Picard show is a good show that respects its continuity…and Q. Please give us Q. Q and Picard are always great together. This movie was awesome. I haven’t laughed that hard during a movie in quite sometime. There were times I was laughing the loudest in the theatre and was still laughing a solid minute after the joke happened. It’s a kids movie to be sure, but there are some hilariously twisted jokes sprinkled in. Along with those, there are some great ‘deep cut’ references to the history of DC movies and shows. If I was never a ‘Teen Titans GO!’ fan, but this movie was excellent – and if you can, you should go see it. You guys remember that time when LL Cool J rapped about how his ‘hat is like a sharks fin’? This ridiculous gem comes to us from the Deep Blue Sea soundtrack, and it’s…it’s just great. I mean seriously, I gotta give kudos to Cool James here, dudes movie single tie-in was actually about the movie. Not only that, he took a bonkers concept and actually made a song about being a genetically altered shark. Dude’s not even phoning it in, he’s going all out on this. Don’t get me wrong, this is absolutely bonkers – but in a good way. It’s so ridiculous I can’t help but enjoy and respect it. 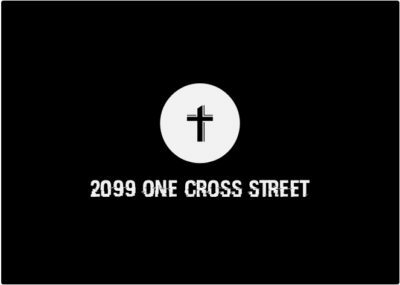 Finally, I want to leave you with this, a great clip from Matt Chandler about owning our sin that is well worth a listen. Hope you all enjoyed todays post! Just a heads up, there won’t be a post next week as my amazing wife and I will be on vacation, but we’ll be back the following week! Hope you all have a great day, and God bless my friends!